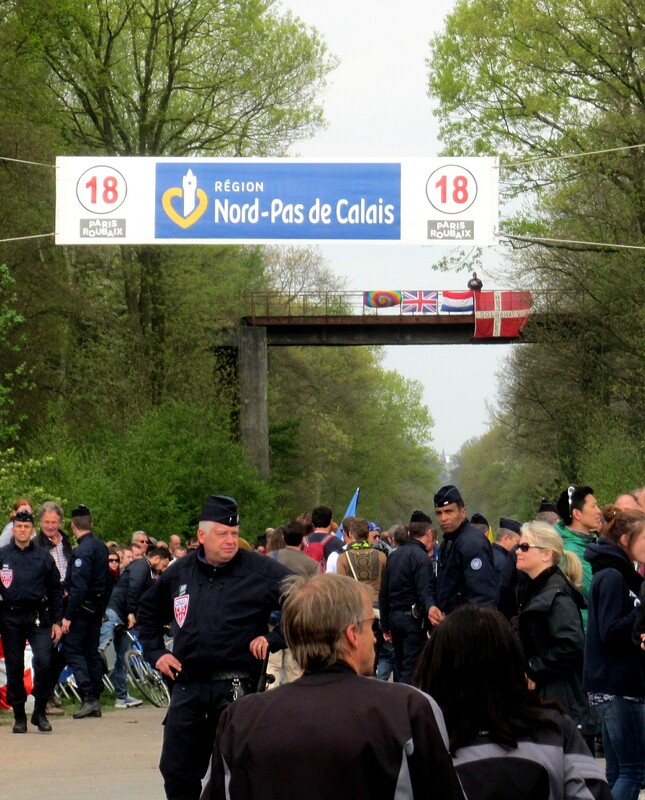 The words of my father as we joined the crowds to watch the Paris Roubaix bike race at the legendary Trouée d’Arenberg, the Arenberg Trench. 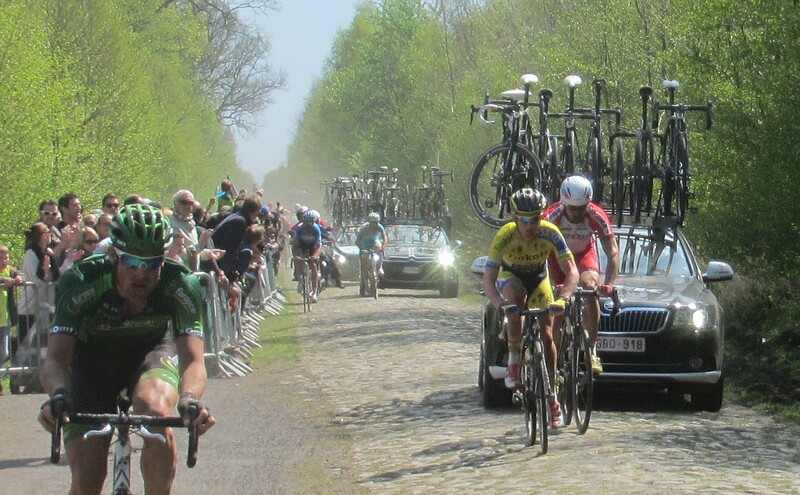 Occasional observers of cycle sport probably know that the way the fans watch cycling is to set off for the big hills so you can see the decisive moments and the riders spread out over a distance, just like I did last week at the Tour of Flanders. 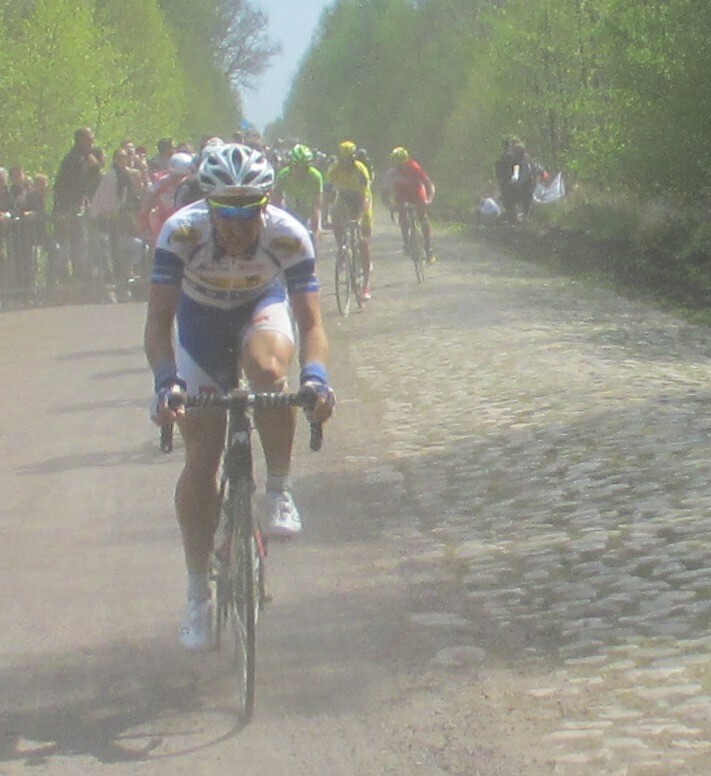 At Paris Roubaix there are no hills, their symbolic place in the race is taken by notorious stretches of old cobbled farm tracks and minor roads in the north of France. A hundred years ago when the race was founded they were the standard road surfaces but today sections have to be discovered or “restored” to retain the integrity of the route. Restored means “made lumpy, muddy and brutal to cycle on”. 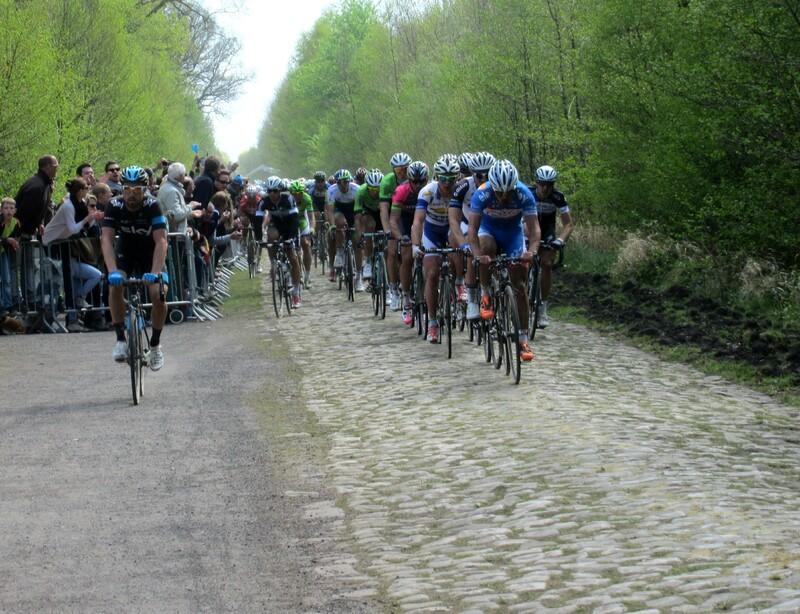 Today the Arenberg is one of the stars of the show. This was a former service road to the old mines of Wallers-Arenberg, discovered hidden in forest by a former rider who not only lived nearby but had worked in the mines. When local roads were improved and made too easy Paris Roubaix diverted over this section and a legend was born. The route is traffic free all year round and shaded by trees so moss grows on the stones creating havoc in wet conditions. The closeness of the fans and the trees gives it the appearance of a tunnel, heightening the impact. 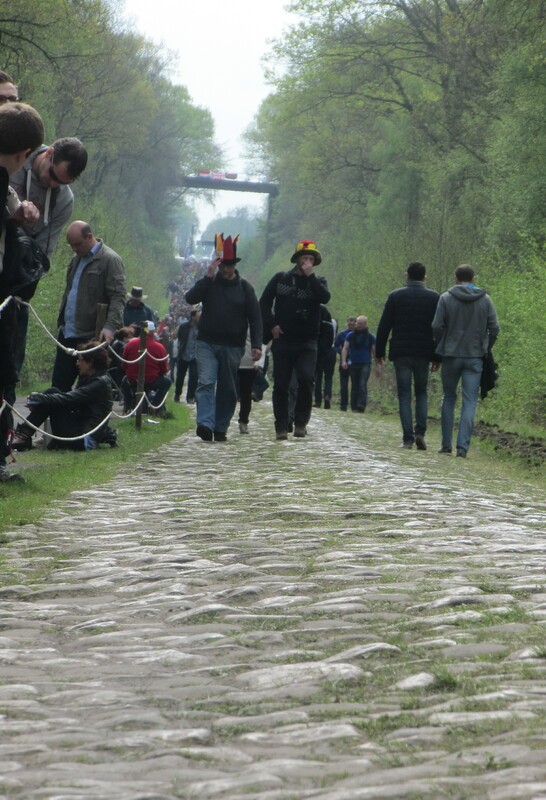 It was actually kicked off the race route for a few years because it became too dangerous for even Paris Roubaix but the local community rallied round and paid for the stones to be restored. It isn’t the decisive moment in the race because there is still 100km to go but it is known as the place where the main action starts. So when I was choosing a place for us to watch our first Paris Roubaix I had no doubt at all where I wanted to be, I have seen it on TV so many times I wanted to be part of that atmosphere. When my research found that there is also a fan village run by the community with the obligatory food, drink, hospitality area and big screen the decision was confirmed, we could watch the race come through and then follow it through to the finish on the screen. The backdrop is the mining museum which celebrates the heritage of the area. We parked about an hour’s ride away and pedalled our way around and through the forest on some delightful car free roads and tracks until we popped out of the trees onto the course. From here the spectators walk along the 2km of arrow straight road that form the route, or as we did they thread their way through the surrounding forest on foot and on bikes. Almost by luck we found a great spot. Almost 2km from the fan village there are slightly fewer spectators and the line at the barrier was not as deep, plus we came out by an official service area which meant there was a bend in the barriers. By standing on the corner of this bend we had an almost unobscured view right down the course which was great in itself, but what we realised was that desperate riders being battered by cobbles will seek any sort of refuge and even 20 metres of smooth path is a huge temptation so they would actually be riding straight at us for a few seconds. And then the atmosphere built up rapidly to an explosion of colour, noise and yellow dust. First a few service cars slewing sideways on the cambered cobblestones, then the police outriders on special trials motorbikes used only for this event. The arrival of the TV helicopter overhead says the race is upon us and the first three riders in a breakaway group hammered by, grimacing as their bikes bounced and clattered over the stones. This is however just an hors d’ouvre. Two minutes behind the breakaway comes the peloton and there are 100 riders going flat out, probably over 45km per hour despite the cobbles, the dust, the slight uphill. At the front the leaders’ team riders were grim faced, spread across the road hammering out an incredible pace each hoping that the centre ridge or one of the gutters is marginally smoother. And at the back of the string the body language was one of complete desperation with riders going through hell just to follow the wheels of the hard men while being hammered by the surface. Noticeably many of the long tail were the small riders who suffer horribly in these conditions compared to the big power men at the front. And all the time the dust, made worse for the later riders by the team cars trying to get through to people with punctures and mechanical failures caused by the terrain. Within minutes it was over and the noise subsided to the excited chatter of the crowd as they melted back into the woods to trudge to their cars and head for home to watch the final two hours on TV. We expected a huge crowd to gather at the big screen however we were going completely against the flow as most French people left, having had their moment and knowing that there was still over an hour to go to find a place to watch. 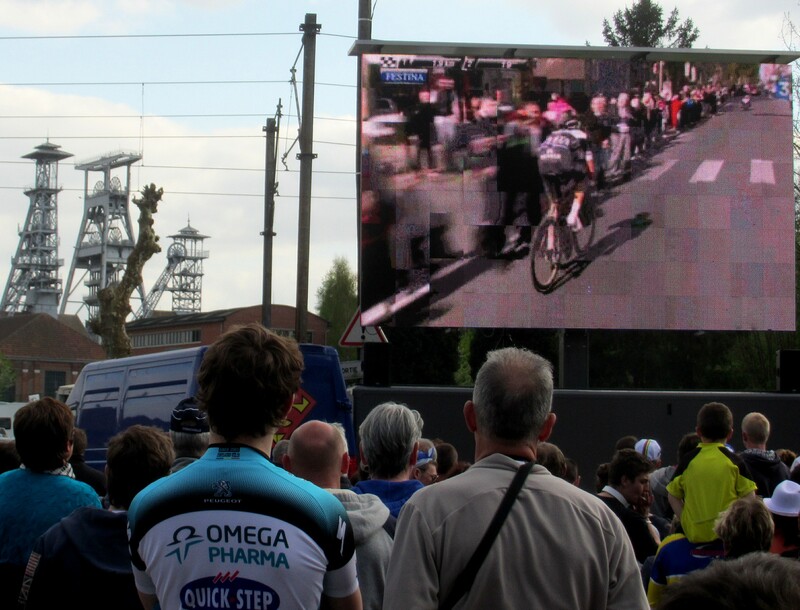 This meant that the crowd down at the fan village had a strong international flavour with the Belgians loudly cheering “Mr Paris-Roubaix”, Tom Boonen, and even a lot of Brits giving a shout when Bradley Wiggins featured in the final kilometres. Final shout of the day was left to the Dutch when their man Niki Terpstra broke away to win the race. A lovely and unexpected feature was when Terpstra crossed the line our whole crowd just broke into applause. 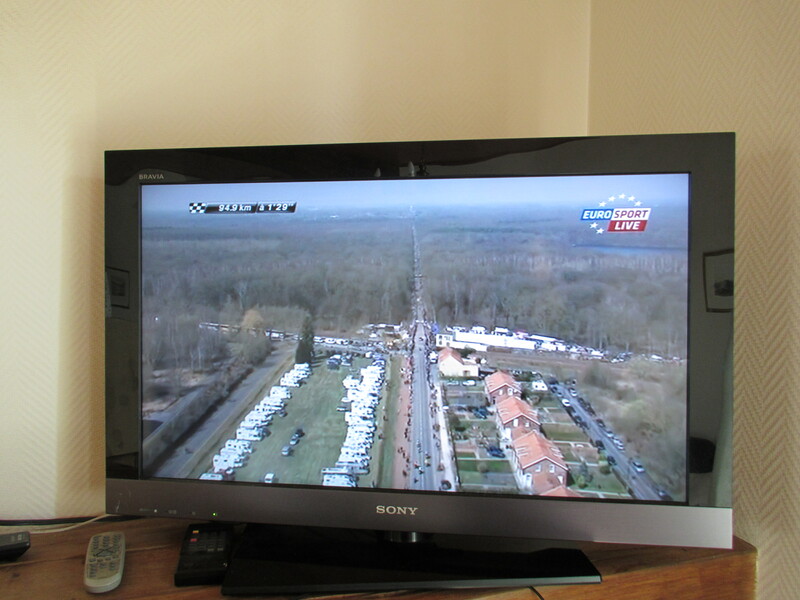 A huge appreciation of what we had seen, and knowledge that Paris Roubaix has never been won by a poor rider. And then my final treat, if you can call it that. 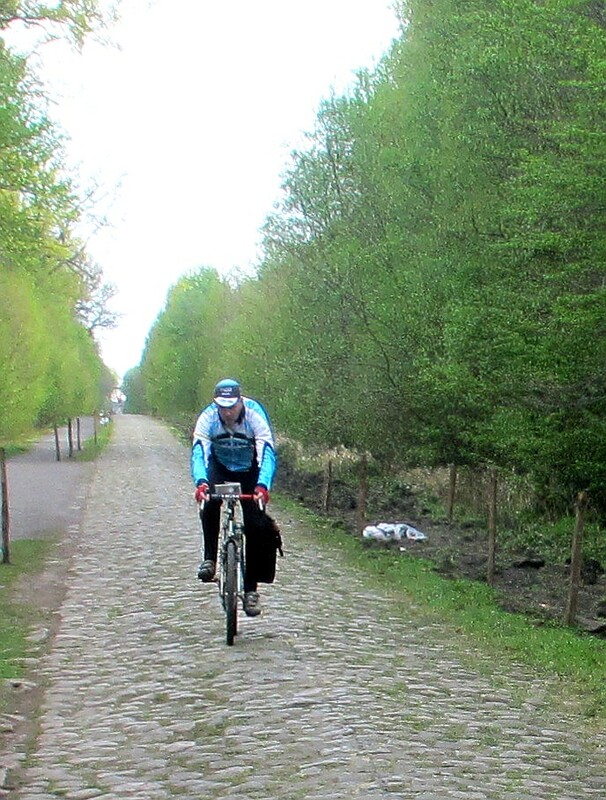 With the forest quiet except for the service crews clearing the barriers and bagging the rubbish the Arenberg Trench was going back to sleep for another year. The crowd were clearing off towards their cars and I realised I had the whole road to myself. Time to ride the Arenberg! Dad made it very clear that he wasn’t going to ride the cobbles, but the side path was now open so he could ride on the smooth section while I went for it. What a ride. I stuck it into the biggest gear I could turn and just hammered down the centre ridge as hard as I could, which was not very hard at all. More of a wobbly plod in fact. 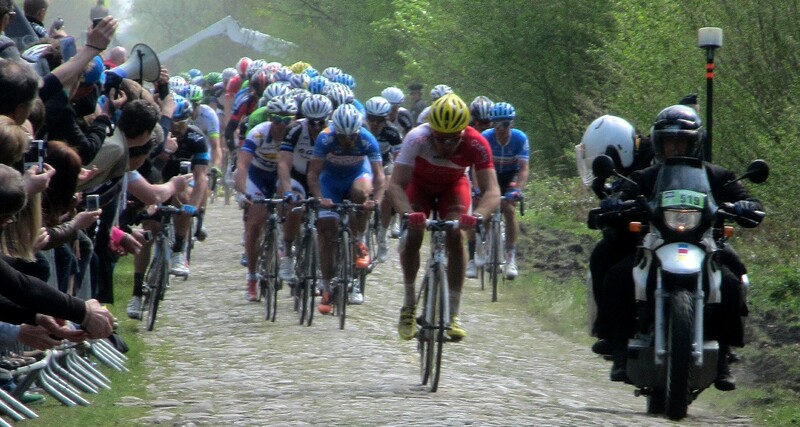 I could say I have ridden worse cobbles in Belgium. I could say I know some roads round my home with bigger potholes. But kept up for 2km, slightly up hill much of the way, funnelled into a relatively narrow width it feels unrelenting. I was puffing and sweating like I had just climbed a mountain for ten minutes. Then I imagined the riders doing 45kmph, after 150km, with another 17 sections of pave to come. They are super-human at times. 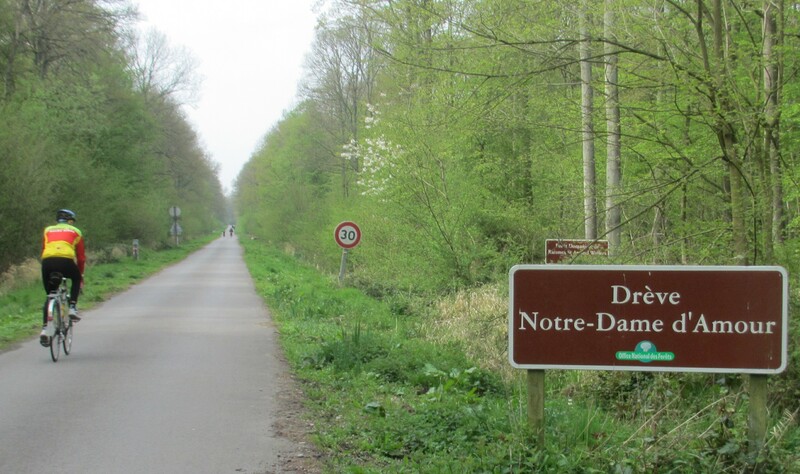 On 9th July Tour de France fans will see these roads in a special 1st World War commemorative stage from Ypres to Arenberg. The occasional watchers of the TV coverage may wonder what all the fuss is about but those who have seen the “Hell of the North” will know that they are witnessing something special. The favoured Tour riders who hate these hard roads of the north and spend these weeks of the cobbled classics riding in Spain and Italy could suffer a lot on a day like this. For my part I will be glued to the coverage because I can say “I was there”. Another unique cycling experience added to my collection. What an extraordinarily diverse machine the bicycle is. I do not despair! Not Team Sky – nuff said. Me. 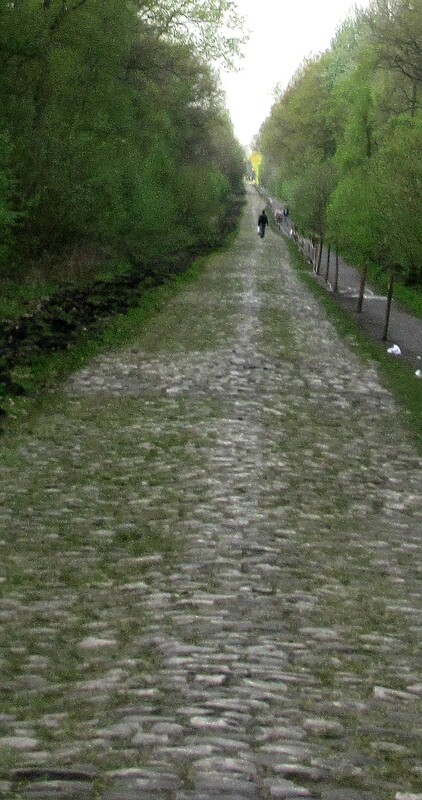 The closest I got to the Arenberg Trench was this. Woke up this morning feeling terrible and certainly not safe to drive, let alone ride a bike. 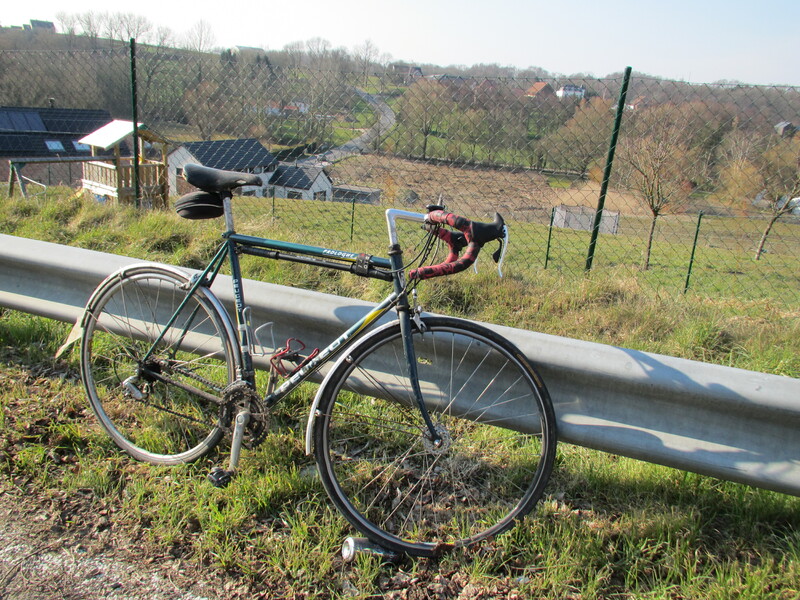 Instead of the lovely 50km ride through the countryside of Belgium and northern France on our first decent spring day I spent my time moping about. This afternoon I felt slightly better and in honour of 30 days of biking I pottered round the lanes for 45 minutes. Feel rubbish now, probably not a good move. Day 7. This should cheer me up ride. 50 minutes.